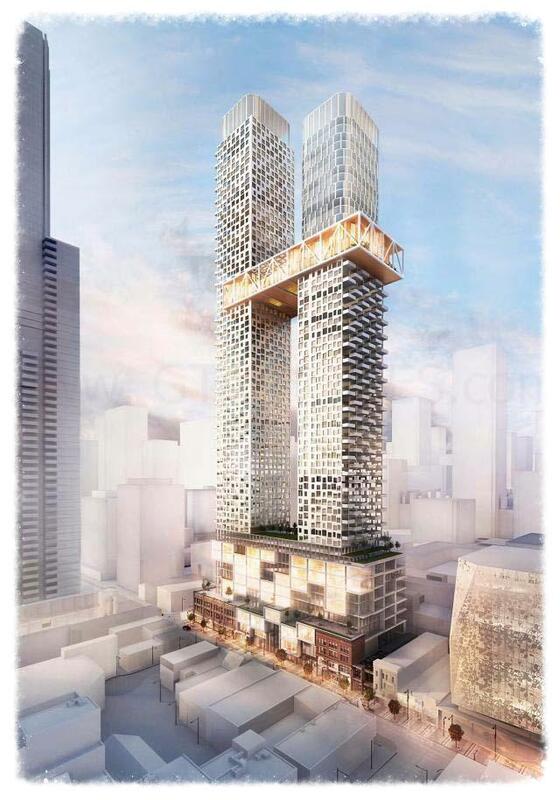 YSL Condos by Cresford Development Corporation is coming soon to Yonge Street and Gerrard Street in Toronto, Ontario. It is a new mixed-use development consisting of office, retail and residential use space currently in pre-construction at 363-391 Yonge Street. There will be two proposed towers of 62 and 73 storeys in height on top of an eleven storey podium with 1,106 dwelling units connected by a sky-bridge and designed by Quadrangle Architects Limited. YSL Condominiums is being developed by award-winning real estate developer, the Cresford Development Group. They are a Toronto-based developer who have been in business for more than forty years and was the "first residential developer in Canada to dress up their condominiums with international fashion labels" such as Diesel, Fendi, MissoniHome, Armani and Hermès in their interior designs. Their top notch designers and suppliers create interiors of high style and fashion creating modern sophistication in practical living spaces. You can find the stylish European Scavolini Kitchens in many of their condominiums. "It’s upscale European elegance integrated with chic urban design to make you feel comfortable in your own home." Cresford condominiums inspires confidence, creativity, trust, happiness and security. Their condominiums are located close to the city's hot spots from "Yorkville to the lakefront" designed by renowned architects that "celebrates life and style". They construct buildings of "superb quality and attention to detail" and below is a list of some of their residential development projects. 1000 Bay Condos - A new condominium development currently under construction and is selling located at 990 Bay Street in Toronto, Ontario with 32 storeys and 478 units. Available unit size range from 715 square feet to 1,168 square feet with prices for available units starting from the high $300,000's. This development is designed by architectsAlliance is scheduled to be completed in 2016. Amenities include concierge, exercise room, yola and pilates studio, media room, party room, billiards room, games room and rooftop terrace. The Clover on Yonge - A new condominium development currently in pre-construction and is selling located at 595 Yonge Street in Toronto, Ontario with 50 storeys and 600 units. Sales for available units start from the $200,000's and is designed by architectsAlliance. This development is scheduled to be completed in 2019. VOX Condos - A new condominium development currently under construction and is sold out located at Yonge Street in Toronto, Ontario with 35 storeys and 330 units designed by architectsAlliance. This development is scheduled to be completed in May of 2017. YSL Condos is being designed by Quadrangle who are an award-winning architectural firm based in Toronto, Ontario with over 100 architects. They were founded in 1986 and have "high-profile clients in media, hospitality, retail and other sectors, as well as leading developers of multi-unit residential projects". Quadrangle Architects Limited is an industry leader because "what everyone at Quadrangle shares in common is a passion for innovative design thinking that meets the real-world challenges of our clients." Together, Cresford Development Corporation and Quadrangle Architects are collaborating to design and develop the YSL Residences coming soon to Yonge & Gerrard. Register with us today for more details on the YSL Condos Platinum VIP Access! For more information, please register today for YSL Residences Platinum Access Preview Event.